384 pages | 112 B/W Illus. This volume provides a comprehensive introduction to foundational topics in sound design for embedded media, such as physical computing; interaction design; auditory displays and data sonification; speech synthesis; wearables; smart objects and instruments; user experience; toys and playful tangible objects; and the new sensibilities entailed in expanding the concept of sound design to encompass the totality of our surroundings. The reader will gain a broad understanding of the key concepts and practices that define sound design for its use in computational products and design. The chapters are written by international authors from diverse backgrounds who provide multidisciplinary perspectives on sound in its many embedded forms. The volume is designed as a textbook for students and teachers, as a handbook for researchers in sound, programming and design, and as a survey of key trends and ideas for practitioners interested in exploring the boundaries of their profession. 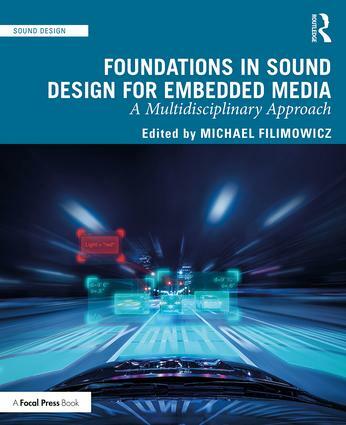 "Foundations in Sound Design for Embedded Media reverberates with valuable insight for today's practitioners. This volume brings together technological and methodological know-how, aesthetic sensitivity, and an understanding of how we listen and shows how these apply to the eclectic array of application areas embedded media now find themselves supporting; I am confident this book will spend more time on my desk than in my bookcase for quite some time to come." -- Paul Vickers, Associate Professor of Computer Science and Computational Perceptualisation, Northumbria University. Michael Filimowicz (PhD) is Senior Lecturer in the School of Interactive Arts and Technology (SIAT) at Simon Fraser University and co-editor of The Soundtrack journal. He develops new forms of general purpose multimodal and audiovisual display technology, exploring novel product lines across different application contexts including gaming, immersive exhibitions, control rooms, telepresence and simulation-based training. He has published across disciplines in journals such as Organised Sound, Arts and Humanities in Higher Education, Leonardo, Sound Effects, Parsons Journal for Information Mapping and Semiotica. His art has been exhibited internationally at venues such as SIGGRAPH, Re-New, Design Shanghai, ARTECH, Les Instants Vidéo, IDEAS, Kinsey Institute, and Art Currents, and published in monographs such as Spotlight: 20 Years of the Biel/Bienne Festival of Photography, Reframing Photography and Infinite Instances. His personal website is http://filimowi.cz. The Sound Design series takes a comprehensive and multidisciplinary view of the field of sound design across linear, interactive and embedded media and design contexts. Today’s sound designers might work in film and video, installation and performance, auditory displays and interface design, electroacoustic composition and software applications, and beyond. These forms and practices continuously cross-pollinate and produce an ever-changing array of technologies and techniques for audiences and users, which the series aims to represent and foster.